Pisa, Italy is a place that is known for one thing: the Learning Tower. The city is certainly not known for its cuisine; in fact, it has been said by various people time and time again that the food in Pisa is not very good. When I decided to stay two nights in Pisa, I knew that I was going to have to eat, so I searched out the best food that the city had to offer. Of course my trip could not have come at a worse time (August) and most of the ‘best’ places in the city were closed, so I had to dig further. I intentionally steered clear of Via Santa Maria, the street directly in front of the Learning Tower of Pisa and where poor unsuspecting tourists were in for an overpriced mediocre meal. I aimed for the center of town surrounding the river and little side alleys as a base where I would enjoy culinary masterpieces. I admit I am not a huge sandwich girl, but when I saw a tip on Go With Oh about Il Crudo Panineria being a “recommended lunch stop, serving freshly made panini and other lunch favorites”, I decided to add it to my list. The sandwich was not typically thought of as a panini (it was more like a sub). In my panini I combined chicken, mozzarella, rucola, and mushroom sauce and it was actually pretty delicious! When searching for it on Google Maps, I found that it was located in a little alleyway right off of the popular Via Guglielmo Oberdan. I ordered the Trancio di Baccalà al Vapore con Friggitelli Saltati (Codfish) and dare I say it was the best codfish I have ever had in life! I found out about Antica Trattoria Da Bruno on the site Reid’s Italy, which described the restaurant as having an “excellent traditional Pisan cuisine in a trattoria setting”. After tiring myself walking between the downtown area and my hostel, I chose this location because of its proximity to my hostel. I ate the Le Pappardelle al Coniglio Nostrano (Pappardelle with Rabbit Sauce). It was my first time eating rabbit and I have to say that I thoroughly enjoyed it. While I found the food to be very delicious, I found my waiter to be a little bit pushy and a little too happy to suggest EVERYTHING on the menu. I respectfully declined every attempt of his to sell me an appetizer, a bottle of wine (I was dining alone, I think that was a little excessive), and every single dessert on the menu. When I searched for gelato in Pisa, a couple of names kept coming up over and over again, and one of those names was Gelateria de’Coltelli. When I arrived, I looked at all of the different flavors that they had to offer and after being stuffed with spoonful after spoonful of samples from the girl behind the counter, I settled on a mixture of pistachio and vanilla, which she informed me was completely natural. She went on to tell me that all of the flavors of gelato that they served were all natural, unlike many Italian gelaterias, and that the majority of the products were locally sourced. I could definitely taste the freshness of both the pistachio and vanilla gelato flavors, however I didn’t fall in love with it. While it was good and natural, it was not sweet enough for me. Another gelateria that I saw mentioned time and time again was La Bottega del Gelato, located right in the heart of the city in Piazza Giuseppe Garibaldi. I ordered a mixture of tiramisu and tuttobosco gelato, and I must just say that tiramisu gelato must be one of the best inventions EVER. I decided that after Gelateria La Carraia in Florence, this place comes in second or third as my favorite gelato in Italy; just simply delicious. Despite the fact that I had been told that food in Pisa was not very good, I found every meal that I had to be pretty tasty. With a little bit of digging and reading, I had an enjoyable experience. 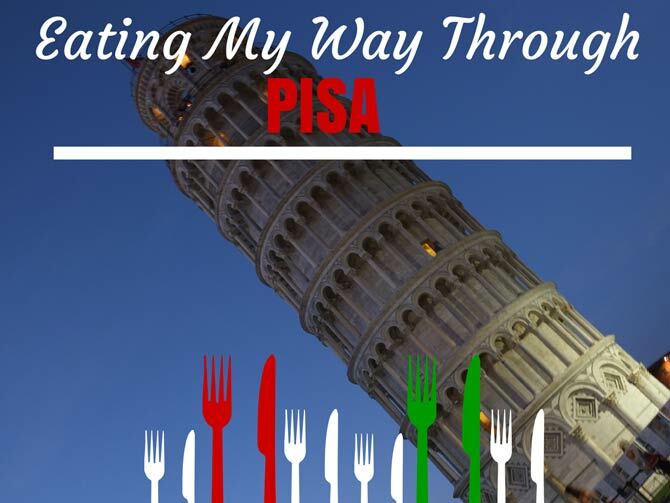 Have you ever dined in Pisa? What were some of your favorite places? Thank you for this! We’re going to be in Pisa next month but just for a day trip. I’m looking forward to trying Il Crudo Panineria and my kids are so grateful for the gelato recommendations. 🙂 We’ll be sure to steer clear of Via Santa Maria. Wonderful! Have a great time and come back and let me know what you thought! I´m headed to Pisa over Christmas–although I´m not sure if these places will be open, it´s always good to have some info to go on. Thanks for the round-up! That’s wonderful! There is a good chance that they will be open be since I visited during the Ferragosto period and they were open 🙂 Have a great trip and come back to share what you ate!